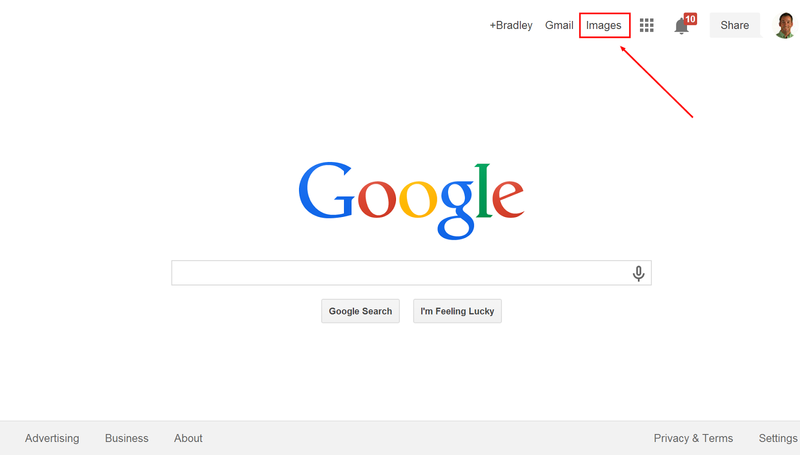 Did you know that Google recently updated its Google Image Search features? 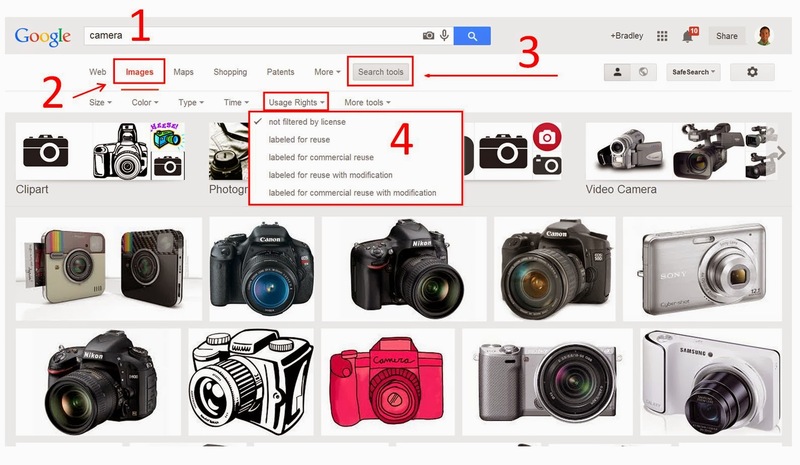 Now, you can simply perform a Google Image Search and click the "Search Tools" button to access Image Search Tools such as Usage Rights and many more. Before Google made this update, users had to click on the Settings icon and select Advanced Search icon when performing a Google Search in order to access additional features, such as changing the Usage Rights of images. This feature was practically hidden, therefore it was not used as much. Now, with this new update, I am hoping that more teachers and students begin to use these additional Image Search Tools to ensure that they are not infringing on any copyright laws. 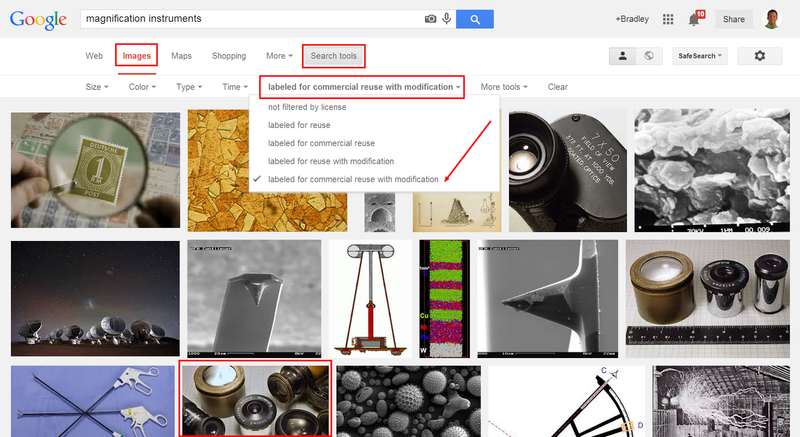 There are four simple steps that you need to complete in order to use the Image Search Tools correctly. Visit www.google.com and perform a Google Search. Select the "Search Tools" button to the right of the search bar. Select "Usage Rights" or any other Image Search Tool that is available. You could also perform a simple shortcut to the first step by simply clicking on the Images button on Google's Home Page. This will take you straight to a Google Image Search. Let's say (hypothetically) that I wanted to find an image that was free to use, share or modify for this blog post. 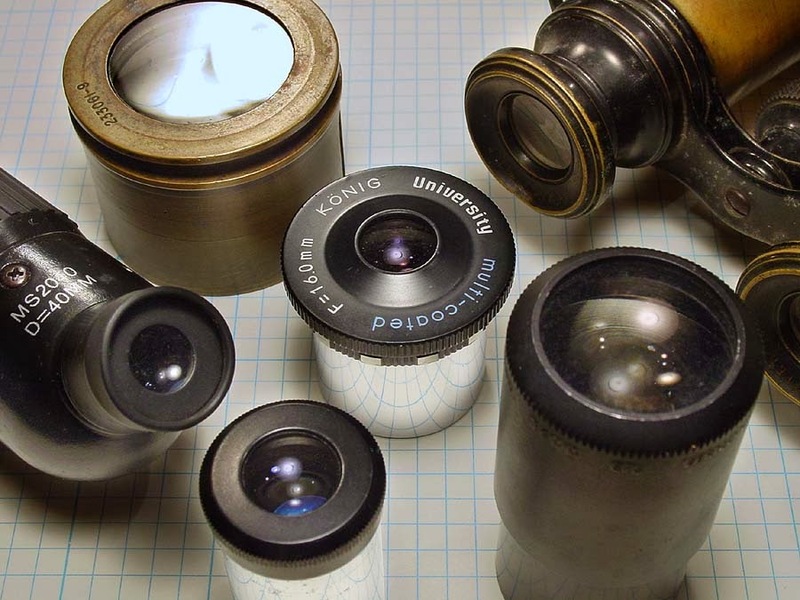 I might perform a Google Image Search for "magnification instruments" and change my Usage Rights, Image Search Tool, to "Labeled for commercial reuse with modification". Then, I would find the picture that I wanted to use, upload it to my blog post, and cite the image with a proper attribution. Well, if you couldn't tell already by the first image I used for this blog post, I guess this wasn't so "hypothetical" after all. The next time you need to perform a Google Image Search, consider using the Search Tools button to find an image that's Creative Commons licensed. How might you integrate this new tool into one of your lessons? How might you teach your students about Copyright? After two weeks of volunteer teaching in Cusco, Peru I hiked up Machu Picchu. This was my view. This is my landscape of learning. Did you know that there is a way to automatically advance your Google Presentation to the next slide? All you have to do is publish your presentation to get these additional options. When you are editing your Google Presentation, simply click "File", then select, "Publish to the web". Then simply go down to the option that reads, "Automatically advance presentation to the next slide" and select preferred amount of time between slides. In addition, you can even get your presentation's "Document link", "Embed code" and you can even change the "Presentation size". Finally, you can also choose to "start your slideshow as soon as the presentation loads", and to "restart after the last slide". These settings are particularly helpful if you plan on embedding your presentation into a website, or if you plan to share the presentation with others. Socrative is a smart, student response system that empowers teachers to collect data from their students via smartphones, laptops, and tablets. I find Socrative to be the most useful SMS app because students can use it on any platform with internet service, rather than phones with text messaging services. I let my students use Socrative with my laptops and iPod Touches in the classroom. It is a great way for teachers to assess students and collect immediate feedback. Teachers login through their device and select an activity which controls the flow of questions and games. Students simply login with their device and interact real time with the content. Student responses are visually represented for multiple choice, true/false and Short Answer questions. For pre-planned activities a teacher can view reports online as a google spreadsheet or as an emailed Excel file. Did You Know? Google Sites No Longer Redirects to Other Websites ... Or Does it? Did you know that Google recently stopped enabling Sites to redirect or forward to other sites (such as a domain that you might have purchased)? I just noticed this today when I tried visiting my website when I wasn't logged into my account and I discovered a blank, white page. Apparently, others have been running into this same issue. I think it might have something to do with a potential security issue. After doing some research, I was able to find a workaround for this. If you still want your Google Site to redirect (or forward) to your own domain, or to another site, all you have to do is check the box in your settings that will "allow embedding of your sites in other sites". Who in the world is viewing The Landscape?